Last Monday, Big Cass pretended to make up with Enzo before attacking him once again. Enzo Amore heads to the ring. He talks about how he’s been beaten up over the past year, but even though he thought Big Cass had his back, Cass was just taking advantage of Enzo’s silver tongue and heart of gold. He says that there’s nothing Cass can do to him in the ring that hasn’t already happened to him before. Enzo gets knocked down, but he always gets back up. Enzo is always true to himself, and he’s confident in his abilities. Enzo starts to leave the ring, but he heads back in and picks his mic back up. He says Cass killed part of him when he turned on him, but the pain and loss are going to drive Enzo to succeed on his own. He’s going to climb higher than he ever has before. Cass watches on a monitor when Charly Caruso asks him for a reaction. Cass says Enzo talks a lot, but he won’t be walking after their match on Sunday. As he’s talking Enzo attacks him from behind. They brawl until some referees and Adam Pearce break them up. A pretty good match. Nia Jax hurt Bayley early which led to the match being a handicap match. Sasha believably held her own during the remainder of the match which certainly helps her going into the title match on Sunday. Not that Sasha really needs more believability. Braun Strowman asks Kurt Angle what he’s going to do since Roman Reigns won’t be able to compete on Sunday. Angle says Reigns will be at Great Balls of Fire, so he doesn’t need to do anything. Strowman wants competition tonight and tells Angle to figure something out. John Cena returns to SmackDown Live tomorrow night on the fourth of July. The story of Brock Lesnar and Samoa Joe. Cedric Alexander heads to the ring. He once again says that the thing between him, Noam Dar, and Alicia Fox is over. He’s tired of Dar and Fox continuing to get in his business, so he tells Dar that he’s going to give him a neck brace to match Fox’s. Pretty good match. It was short, but I liked the aggression from Alexander. Fox also got involved a little, so it was good for the story even if it didn’t feel like a feud-ending match. The Miz enters the ring with Maryse, Curtis Axel, and Bo Dallas for “Miz TV.” Miz talks about how he exposed the Ball family for what they are last week. He goes on to say that Dean Ambrose has wasted all his potential. He says Dean Ambrose can’t handle success. He can’t be a top guy like The Miz. Ambrose comes out to the stage. He says everything Miz just said is true. And since Miz knows him so well, he should know that Ambrose is going to want his rematch for the IC Title tonight. Ambrose heads towards the ring, but Heath Slater and Rhyno interrupt. Slater says that the last person to beat The Miz wasn’t Ambrose, it was Slater. Slater hasn’t had an IC Title shot since he’s been in WWE. He has kids, so he needs this opportunity for a title shot. Ambrose tells Slater to get in line. Miz says Ambrose will get his rematch when Miz says he’ll get his rematch. Miz begins to make an excuse why he cant defend the title when Kurt Angle comes out to the stage. Angle tells Miz that he doesn’t decide when he competes, Angle does. Miz references Angle’s personal problems which only makes Angle angry. Miz says he’ll compromise and defend his title at Great Balls of Fire. He just wants Angle to decide who he’ll face, Slater or Ambrose. Angle says he’ll face both (potentially). He’ll face Ambrose at the PPV and he’ll defend his title tonight against Slater. The match, of course, happens now. This was good. I enjoyed it. Slater put up a good fight a had a few really nice moves and moments towards the end of the match. This also helped demonstrate the benefits and dangers of having Axel and Dallas at ringside. The Miz throws Slater out of the ring after the match where Axel and Dallas attack him. Ambrose runs to the ring to help Slater, but he ends up getting attacked as well. After getting beat up, Ambrose is hit with a Skull Crushing Finale. In the ring, Goldust welcomes everyone to the premiere of The Shattered Truth. He thanks all the little people in the crowd. He also thanks R-Truth for being so naive and selfish. He then plays his movie on the tron. It consists of a heavily edited version of Goldust’s attack on R-Truth last week. Back in the ring, R-Truth is standing behind Goldust as the movie ends. R-Truth attacks, brawling for a little while before throwing Goldust shoulder first into the ring post. Goldust backs away up the ramp. Kurt Angle tells Cesaro & Sheamus that they will compete in a 30-minute iron man match for the RAW Tag Titles at Great Balls of Fire. Cesaro & Sheamus like the idea. Cesaro also wants some competition tonight though, and he specifically wants Finn Balor. Angle is fine with it, so he makes the match. This was pretty much a joke match. One move, done. Rollins gets on the mic after the match and addresses Bray Wyatt. Rollins says he doesn’t hide from his faults and mistakes, he learns from them. This Sunday Rollins will prove that Wyatt isn’t a god. Michael Cole interviews Samoa Joe, Brock Lesnar, and Paul Heyman via video split-screen. Joe interrupts Cole and wonders why he’s still answering questions after the statements he’s made over the last few weeks. Joe asks Heyman how it felt when he attacked him, but Lesnar intterupts. Lesnar says this is between him and Joe, and Sunday Joe will be beaten. He calls Joe a coward for his attacks. Joe gets more and more worked up while Lesnar laughs. Joe says they’re doing this interview via video for Lesnar’s protection. Joe has had enough. He throws down his mic and goes hunting for Lesnar. Joe walks through the halls flanked by referees, Adam Pearce, and Jamie Noble. Joe finds where Lesnar is set up, but he’s restrained and pulled away by security. Good match. Ali looked particularly good early, but Neville looked particularly vicious for the majority of the match. Ali got beat up pretty soundly which is god for Neville going into his title defense against Tozawa on Sunday. Bray Wyatt is in a desert. He talks about giving mankind the gift of fire and independence. Chaos can brighten the darkest of shadows. Bray Wyatt is that chaos. Bray Wyatt is everywhere. Charly Caruso asks Alexa Bliss if she’s worried about Sasha after her win tonight. Bliss says she let Sasha win as part of her strategy. Caruso doesn’t buy it. Bliss doesn’t care. Really good match! This had some very good action between Cesaro and Balor, and the ending descended into chaos with everyone around the ring (including Elias Samson who had come down to ringside). 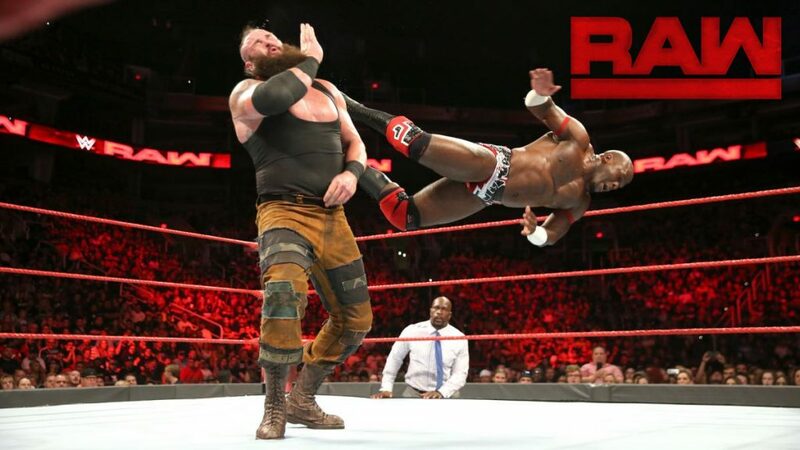 The great part of the brawl at the end was that everyone was attacking everyone, but neither Cesaro nor Balor were attacked by any of the men not in the match so it made perfect sense that the match wouldn’t be called a DQ. This was a lot of fun and made me want to see a feud between Cesaro and Balor. Braun Strowman heads to the ring. He says that there are few things he enjoys more than beating up Roman Reigns. But Reigns isn’t here tonight, and Strowman still wants competition. He calls for Angle to send out whomever he chose as Strowman’s opponent. Titus O’Neil comes out to the stage. He hypes Titus Worldwide and introduces Apollo Crews. O’Neil and Crews head to the ring. Good match. This was actually pretty interesting. I was really pulling for Crews to have a good showing, and he did. Briefly. As expected, Strowman took over with a nasty looking kick when Crews went for his standing moonsault. After that it was all Strowman. But Crews did manage to chop Strowman down to the mat at one point, and that’s all that really matters for him. I think this was very good for both Crews and Titus O’Neil. It showed some inexperience and bad decisions on their part, but it also showed a lot of heart and unity. I like it. And I’m really starting to get behind Titus Worldwide. I hope it lasts. And grows. Strowman goes for another powerslam after the match, but O’Neil pulls Crews out of Strowman’s grasp. O’Neil gets into the ring, faces off against Strowman, then attacks. After a few strikes Strowman hits O’Neil with a powerslam. Strowman then takes Crews out through the crowd. Strowman throws Crews into an ambulance near the stage, but the ambulance doesn’t drive away. Strowman seems confused. He goes to the driver’s side of the cab and is promptly attacked by Roman Reigns. The two brawl around and onto the stage. Reigns manages to gain an advantage and spears Strowman off the stage and through some tables. Both men are back on their feet before the show ends. I really liked this show. It had some very good moments. The Enzo Amore promo was great and I’m glad they’re making him interesting to listen to. The story line is pretty basic and cliche, but Enzo’s promos are making it worthwhile. There were a few very entertaining matches on this show too. I liked seeing Slater involve himself in the IC Title feud, Neville’s match was straightforward but felt important, Cesaro and Balor had a great match that touched on lots of different story elements, and the main event, despite Strowman being in it, was interesting. I think this was one of the better overall shows as of late. Great action, great chaos, clever booking, and many stories were touched on. This was a very well put together match all around.